The Chilean J/24 National Championship was sailed on the waters of the Bay of Concepción, based on Quiriquina Island, for a dozen J/24 teams. A select group of famous South American J/24 sailors were invited to participate as crew aboard various boats, including Brazilian Mauricio Santa Cruz, multiple World and South American Champion. In addition, Argentine Matias Pereira, multiple South American Champion, Pan-American Champion and multiple Argentine Champion was crew. And Nicolas Cubria, former Argentine Champion, also sailed as crew. Each one of them sailed as crew with a top Chilean helmsman. Positioning themselves comfortably in first place on the first day of racing was the Chilean Del Castillo and his crew (all local) who won three of the four races. In the first two days, the winds were mild. But, as the racing progressed and the wind increased, it was a trade-off between the top end genoa or the jib. At the end of the last race, the teams of E. Fernandez and N. Cubría with the crew of Carlos del Solar and Mauricio Santa Cruz were tied on points. As in the last regatta, Del Castillo won and qualified as Chilean 2018 J/24 Champion. Second was Carlos del Solar with Mauricio Santa Cruz. Third was Patricio Rodriguez’s team with Matias Pereira. Fourth was Raúl del Castillo. For more Chilean J/24 Class information, visit http://j24arg.blogspot.com/. Gusty Shifty Northerly on Sunday: The final day started with a good strong wind in the 20-plus knots range from the Northwest and, as the day progressed, it kept rotating into the NNE quadrants and slowly diminishing in pressure. 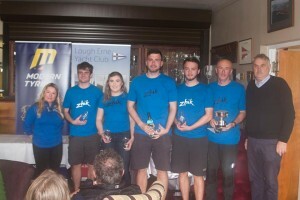 Despite the difficult conditions to keep resetting marks for the Race Committee and mark boats, they managed to pull off running four races. That meant all the teams could enjoy one discard race for the final results. In these challenging weather conditions, it was clear the top two teams were CARRERA and SEA WOLF. 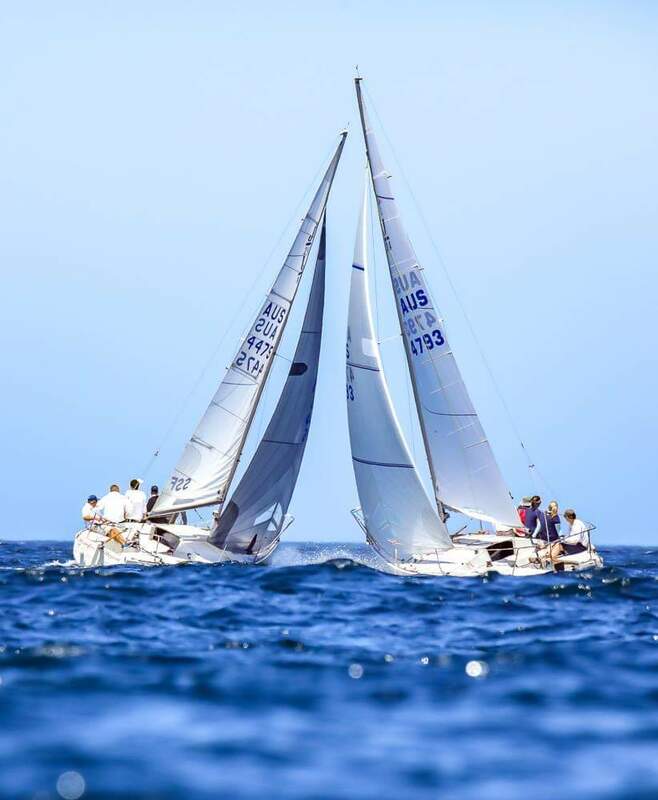 Posting their worst result of the regatta on the opening race (a fourth), the CARRERA team closed with a commanding tally of 3-1-1 to win the regatta with just 8 points net. The SEA WOLF crew won the first race of the day and closed the regatta with a 6-2-3 to take the silver with 17 points net. The MORRUCHO crew’s 3-10-3-6 scoreline gave them third place on a 21 points tie-breaker over RINA-ALAGUA (team led by Nicolas Cubria and crew of M. Cubria, F. Bertrand and J. Filidoro). For more Argentina J/24 Championship information, visit http://j24arg.blogspot.com/. 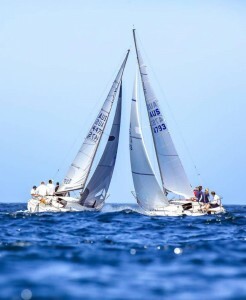 Thanks to Mick Reynolds for this report from Australia: Cronulla Sailing Club, in partnership with the J/24 Southern Sydney Fleet, again hosted the NSW State Championship in the water of Bate Bay. Saturday came with the crew briefing led by starter Bruce Swane, laying down the law and setting the scene for what was to come—two days of exciting, frustrating but most of all enjoyable and friendly one-design racing. Race 1 got underway in a steady though light 8 knot Easterly shooting out from Shark Island into Bate Bay. Twelve J/24s headed out, popping spinnakers and heading into Cronulla, only for half the fleet to be becalmed at the bottom mark and the leaders TINTO (S Wright) and INNAMINCKA (J Crawford) streaking ahead on the breeze. However, the wind returned with TINTO first, followed by INNAMINCKA in second and WATERBORNE AGAIN (B Lee) in third. Race 2, and the cream began to rise. Sean Kirkjian driving KAOTIC, past multiple Australian and NSW Champion, came in first followed by TINTO and the forever young Cronulla local David Mckay in STAMPED URGENT. The Race Committee then began the search for the elusive wind……AP flew, and the fleet began the race into the clubhouse for some stories of where’d the wind go followed by some great BBQ delights. And to enjoy the $500 bar tab supplied by the Harbour Fleet (also, on Sunday night). Cheers! Sunday arrived with an increasing Northeasterly in race 3, and all but one went with the genoa (however that changed). Brenden Lee from Sandringham Yacht Club took race 3 followed by KAOTIC and ACE (D West). All under jib in race 4, and again the man from Sandringham driving WATERBORNE AGAIN came first, VORTEX (C Lee) in second and STAMPED URGENT made up the podium. Special mentions go to the team on JARGON (J Macquart) making the most of the one-design nature of a J/24, flying his kite sideways to take advantage of the blustery NE summer breeze. Race 5, and KAOTIC returned to the top spot, ACE in second and WATERBORNE AGAIN in third, so the title was to be decided in the final race. With the course reset into the estuary, the results of Race 6 were to reflect the final overall result: KAOTIC in first, followed by WATERBORNE AGAIN and TINTO following. Congratulations to Sean Kirkjian and his crew on KAOTIC, NSW Champion 2018, in front of Brenden Lee from Sandringham on countback and Steve Wright from the Cronulla Sailing Club in third. Performance results saw VORTEX skippered by Chris Lee making a return to one-design racing in first, followed by KAOTIC and in third WATERBORNE AGAIN. Cronulla SC and the J/24 Fleet of Southern Sydney would like to thank all the sponsors: Spot-A-Yacht photography, My Sail Team management, Macquart Marine, Wet Tech Rigging and Infinity Rigging. J/24SSF would also like to thank the team of volunteers at Cronulla Sailing Club, making this Championship one of the best to date, from the cooks on the BBQ to the servers behind the line, the on-water crew moving marks and setting courses to the results team getting everything online quickly and efficiently, thank you. Photo courtesy of Ben Williams from Spot-A-Yacht. The 2018 World Council Meeting took place in Miami, Florida USA on October 20. Minutes of the Meeting can be viewed at http://www.j24class.org/organization/class-documents/wcm-minutes/. The Hamburg Sailing Club hosted its annual end-of-summer Alster Regatta on the Alster Lake in the middle of Hamburg, Germany. In the octet of J/24s, it was a virtual sweep of the five races by the German GER 5420 team of Emily Kern, Maike Hass Oko, Gesa Goellner, Johanna Richter and Tom Stryi. Two points back was GER 5467 sailed by Hauke Krussg, Nils Glockow, Rollo Boehm, Olaf Schmidt, Tina Lulfing and Torsten Glawisch. Third was GER 4718 skippered by Jonas Hentschel, with crew of Fabian Blasi, Jonas Franke and Jannik Barop. For more Spätsommerpokale Alster Regatta information, visit https://www.hsc-regatta.org/. Will Welles’ Kaster of the USA has achieved his second J/24 World Championship in five years, this time at the 40th edition of the prestigious Championship in Riva del Garda, Italy. With crew Nick Turney, Rich Bowen, Giuliano Cattarozzi and Andrea Casale, the Newport, RI-based helmsman recorded 47 net points in 10 races. Next best was Nobuyuki Imai’s Siesta of Japan who ended with 68 points. Three Americans followed: Keith Whittemore’s Furio, Travis Odenbach’s Honeybadger and Mike Ingham’s Nautalytics, who dominated Friday’s three contests with a 2,1,1. The day’s other race winner was Welles. Eighty-nine teams from 14 countries (Australia, Brazil, Denmark, France, Great Britain, Germany, Greece, Hungary, Ireland, Italy, Japan, Netherlands, Sweden and United States) competed August 27-31 from Fraglia Vela Riva del Garda. Complete results may be found at http://www.j24worlds2018.it/results/, and photos are available on the J/24 Class Facebook page. Lake Garda delivered more of the same champagne conditions on the middle day of the J/24 World Championship in Riva del Garda, Italy. American Will Welles’ Kaster showed the same consistency, posting two second place finishes in Wednesday’s pair of races. Welles now boasts a seven-point advantage over Nobuyuki Imai’s Siesta of Japan, who won the opening contest but added a seven in the next. Daniel Frost’s JJOne of Germany continued his ascent up the rankings with a 4,3 to move into third at 36 points, with Keith Whittemore’s Furio of the USA looking over his shoulder one notch back. Imai’s Siesta stayed hot, winning the opening match Wednesday in the familiar 10-16 knot lake winds. Welles and Whittemore followed. Whittemore’s Furio earned his first bullet of the series in race seven, with Welles repeating in second and Frost third. Eighty-nine teams from 14 countries (Australia, Brazil, Denmark, France, Great Britain, Germany, Greece, Hungary, Ireland, Italy, Japan, Netherlands, Sweden and United States) are competing in the 40th edition of the Championship. Racing continues through Friday from Fraglia Vela Riva del Garda. Complete results may be found at http://www.j24worlds2018.it/results/, and photos are available on the J/24 Class Facebook page. The leaderboard tightened up Tuesday at the J/24 World Championship in Riva del Garda, Italy. Lake Garda again produced fantastic conditions as the 89 teams recorded two more races, bringing the total to five, including now one discard. American Will Welles’ Kaster maintained the top spot with 18 net points, but Hungarian Tomai Bala’zs’ J.Bond 037 is just two points back in second place with 20, and Nobuyuki Imai’s Siesta of Japan launched up to third with 21 points. Both Welles and Bala’zs stumbled in the day’s final race, but benefited from the throw-out. 2016 World Champion Daniel Frost’s JJOne of Germany ruled the day, winning the first contest, and placing second in the next. Following Frost in Tuesday’s opener were two Americans: Keith Whittemore’s Furio and Travis Odenbach’s Honeybadger. Imai’s Siesta also had a solid day, leading the fleet home in race five, ahead of Frost and fellow Japanese sailor Tomomi Hatakeyama’s Gekko. Eighty-nine teams from 14 countries (Australia, Brazil, Denmark, France, Great Britain, Germany, Greece, Hungary, Ireland, Italy, Japan, Netherlands, Sweden and United States) are competing in the 40th edition of the Championship. Racing continues through Friday from Fraglia Vela Riva del Garda. Complete results may be found at http://www.j24worlds2018.it/results/, and photos are available on the J/24 Class Facebook page. Lake Garda lived up to its “bucket list” reputation on the opening day of the J/24 World Championship in Riva del Garda, Italy. Eighty-nine teams from 14 countries (Australia, Brazil, Denmark, France, Great Britain, Germany, Greece, Hungary, Ireland, Italy, Japan, Netherlands, Sweden and United States) descended on the picturesque lake for the 40th edition of the Championship. With sunny skies and breeze at 10-15 knots, American Will Welles’ Kaster got out of the gate with the early advantage, posting 2,5,2 for nine points in the three races. Hungarian Tomai Bala’zs’ J.Bond 037 started the day strong with 1,2, but a 13 in race three left him with 16 points for second place. Travis Odenbach’s Honeybadger of the USA rests in third place with 29 points. Bala’zs opened the regatta with a victory, ahead of Welles and Italian Ignazio Bonanno’s La Superba. Keith Whittemore’s Furio, USA, took the next battle, as Bala’zs dropped to second and Duncan McCarthy’s Madeleine of Great Britain put another nation on the leaderboard. The final contest saw McCarthy, Welles and Whittemore comprise the top three. Racing continues through Friday from Fraglia Vela Riva del Garda. Complete results may be found at http://www.j24worlds2018.it/results/, and photos are available on the J/24 Class Facebook page. The 2018 J/24 World Championship organized through August 31 by Fraglia Vela Riva del Garda in Italy is about to begin. Ninety-eight boats are registered representing 16 countries (Australia, Brazil, Denmark, Estonia, France, Great Britain, Germany, Greece, Hungary, Ireland, Italy, Japan, Korea, Holland, Sweden and United States) for the Championship which will officially start on Sunday 26 August with the opening ceremony. In addition to the ceremony that will kick off the highlight of the 2018 season of the J/24 Class, Sunday also features a practice race and Skippers’ Briefing. From Monday the 27th until Friday the 31st, 10 races are scheduled. There are also numerous shoreside events for racers such as the gala dinner scheduled Tuesday and the awards at the end of each day with pizza and beer. The 2018 J/24 World Championship Race Officials are led by the Jury (chaired by German Willi Gohl), the Race Committee (chaired by American Hank Stuart), the Technical Committee (Chief Measurer Argentine Alexander Finsterbusch) and the Regatta Coordinator Giuseppe De Mattia. Technical sponsor of the J/24 World Championship is Alce Nero (www.alcenero.com), the brand of farmers, beekeepers and organic processors committed since the ’70s in producing good food, fruit of an agriculture that respects the earth and its fertility. More information is on the Facebook page J/24 World Championship 2018 and on www.j24worlds2018.it. Experience and consistency were the key to success at the J/24 European Championship that was held in Glücksburg, Germany from 23 to 27 July. In light winds and shifty conditions, Peer Kock and his team from Hamburg had an impressive series which led the way to the overall victory. In the end, Kock had an 8-point lead on the second placed crew of JJ One from Berlin. Third place was also claimed by a German team: Stefan Karsunke and his crew of Schwere Jungs. Accurat with helmswoman Johanna Maske from Berlin won the U25 title. Laura Hatje and her team of Juelssand (Hamburg) won the Ladies Trophy. Bad Behavior has blocked 1951 access attempts in the last 7 days.